At JustFoodForDogs we regularly receive a number of questions about our products as well as the commercial dog food industry in general. Here are a number of our most frequently asked questions. If you have a question that is not answered here please contact us and we’ll forward it to the appropriate team member and provide you with an answer as quickly as possible. What if JustFoodForDogs sits at room temp for an hour or so after thawing? An hour or even two is not going to be a problem. Think about it like people food, if you had a party and had shrimp cocktail out for an hour or so, people are not going to get sick from it. Just as with human food, if the food stays out overnight, it should be thrown away. How do I store JustFoodForDogs? The easiest way is to get into a cycle of freezer, refrigerator (in plastic or glass container), and bowl. Thawing in the refrigerator or in cold water is best. Food lasts typically a year in the freezer. Does JustFoodForDogs meet AAFCO standards? Yes, all of our canine daily diets have gone through AAFCO feeding trials at a major university. From the day we opened, we have balanced our food for dogs to the National Research Council (NRC) standards. The NRC reports directly to the FDA and is the most up to date authority on nutritional guidelines. Our feline recipe is formulated to meet the 2016 AAFCO nutritional profiles for feline maintenance. 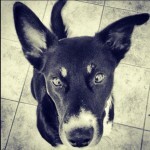 Can someone from JustFoodForDogs speak with my vet about my dog’s nutritional needs? Yes, our Nutrition Consultants can speak to your vet to discuss some dietary options for your pet(s). For questions more technical in nature, you vet may speak to our team of seven veterinarians, including Dr. John Tegzes, VMD Dipl ABVT (our board certified veterinary toxicologist), Dr. Oscar Chavez, BVetMed MRCVS MBA (our Chief Medical Officer), and a team of five veterinarian formulators who create custom diets for the most complicated cases. Your food contains carbohydrates, why? We believe carbohydrates can be an excellent source of energy when that carbohydrate is from a whole food, human grade source. We believe feed grade carbohydrates and grains must be avoided at all cost, due to possible contamination with toxins from an unregulated production system. We also offer grain free and gluten free diets for dogs that may have sensitivity to those ingredients. Does JustFoodForDogs use any preservatives? What does “balanced” food mean? It is nearly impossible for pets to get all of the nutrients they require daily from food alone so any pet food must have added supplements if it is to be intended for long term feeding. Our food is balanced to the standards established by the National Research Council (NRC), and then field tested with AAFCO feeding trials. Unlike typical dog food, we add supplementation that is intended for humans, so the bioavailability is much greater. What do you mean when you say “whole” food? We mean real, un-processed, bioavailable, and nutrient-rich ingredients in their natural state. All of our ingredients are 100% USDA inspected and approved for Human Consumption, and our meats are USDA certified. “Human Grade” is ill-defined and as we know, quality can vary (fast food is “Human Grade”). Our ingredients are restaurant quality meats and vegetables delivered by premium suppliers to the restaurant industry. (Please see our recipe page for real ingredient pictures and more specific recipe information). Yes, in local areas around our kitchens. Please visit our Service page for more information. Does JustFoodForDogs have a satisfaction guarantee? Yes. Please visit our JustGuarantee page for more information. What do I do if my dog gains unwanted weight while on JustFoodForDogs? The correct serving amount of JFFD will keep your dog healthy, happy and fit. If you see your dog gain unwanted weight, then simply trim the volume of food you are feeding by small increments, 5-10% until he reaches the desired weight. All dogs (like people) have their own metabolism so it’s impossible to know how much each dog should consume just by knowing their weight. It’s a process and no one is in a better position to judge the results than you. Do I need to add a multi vitamin to my JustFoodForDogs? No, all JFFD recipes are completely balanced for long term feeding. Only thing you need to add is love and exercise. 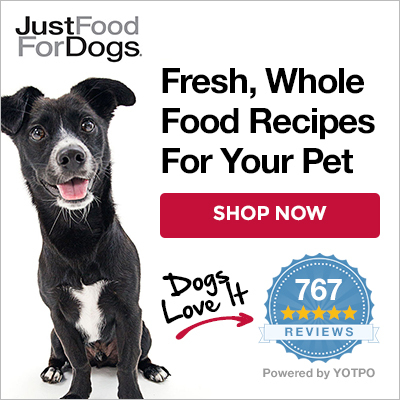 How many JustFoodForDogs treats can I feed my dog? As a general rule, no more than 10% of your dog’s caloric intake should come from treats. I have heard that dogs do not need vegetables in their diet because they are carnivores. Why does your food have vegetables? For starters dogs are not true carnivores, they can actually live without meat in their diet although we believe a diet containing meat is much better. JFFD contains fresh vegetables and fruit because these ingredients provide excellent sources of antioxidants, omega – 3 fatty acids, glucosinolates, thiocyanates and a variety of vitamins. Our food is cooked by hand in our own custom human-grade dog kitchens. We are always open to the public and welcome folks to come in and watch the food being made.